SUMMARY:Lyme disease has a worldwide distribution and is the most common vector-borne disease in the United States. Incidence, clinical manifestations, and presentations vary by geography, season, and recreational habits. Lyme neuroborreliosis (LNB) is neurologic involvement secondary to systemic infection by the spirochete Borrelia burgdorferi in the United States and by Borrelia garinii or Borrelia afzelii species in Europe. Enhanced awareness of the clinical presentation of Lyme disease allows inclusion of LNB in the imaging differential diagnosis of facial neuritis, multiple enhancing cranial nerves, enhancing noncompressive radiculitis, and pediatric leptomeningitis with white matter hyperintensities on MR imaging. The MR imaging white matter appearance of successfully treated LNB and multiple sclerosis display sufficient similarity to suggest a common autoimmune pathogenesis for both. This review highlights differences in the epidemiology, clinical manifestations, diagnosis, and management of Lyme disease in the United States, Europe, and Asia, with an emphasis on neurologic manifestations and neuroimaging. Blacklegged tick (I Scapularis): adult female, adult male, nymph, and larva. Reprinted with permission from the Centers for Disease Control and Prevention. This review will highlight the differences in the epidemiology, clinical manifestations, diagnosis, and management of Lyme disease in the United States, Europe, and Asia. Emphasis is placed on the diagnosis and clinical spectrum of Lyme neuroborreliosis (LNB), with special attention to the varying features of corroborative diagnostic neuroimaging. Erythema migrans rash with the typical target appearance that is virtually diagnostic of Lyme disease. I scapularis ticks may also transmit other infectious agents, such as Anaplasma phagocytophilum (anaplasmosis) or human granulocytic ehrlichiosis, human monocytic ehrlichiosis, Babesia microti (babesiosis), and, less commonly, Franciscella tularensis (tularemia). Southern tick-associated rash illness (STARI) and Master disease are transmitted by the lone star tick (Amblyomma americanum) in the southern United States and may have a clinical presentation similar to that of Lyme disease due to the transmitted bacterium (Borrelia lonestari). The diagnosis of Lyme disease should be based on a history of tick exposure, epidemiology, clinical signs and symptoms at different stages of the disease (Table), and the use of serologic tests. Early Lyme disease in a patient with erythema migrans is virtually 100% specific and more sensitive (57%–86%) than serology.24 Adults at risk for tick-borne disease who develop persistent “summer flu” symptoms should increase the clinical suspicion of tick-borne illnesses, such as Lyme disease. Most patients with suspected Lyme disease are currently tested for evidence of antibodies against B burgdorferi. However, B burgdorferi has extremely complex antigenic composition, which may vary by host and stage of the infection. Therefore, the use of indirect methods to detect serum antibodies to B burgdorferi, based on a 2-step method by using an initial enzyme immunoassay (EIA) or an enzyme-linked immunosorbent assay or indirect florescent antibody assay, followed by confirmation of a positive or equivocal initial test by immunoblot or Western blot is commonly used.25 The 2-step method has advantages, such as ease of testing, better standardization, and greater diagnostic sensitivity than PCR but lacks sensitivity in early disease.16,24 Current standards for the diagnosis of Lyme disease include a sensitive EIA, followed by Western blot (or immunoblot) with findings of abnormal immunoglobulin M (IgM) (at least 2 bands) and immunoglobulin G (IgG) antibodies (at least 5 bands). The likelihood of a person developing LNB is dependent on the Borrelia species, geography, recreational habits of the individual, and season of the year. 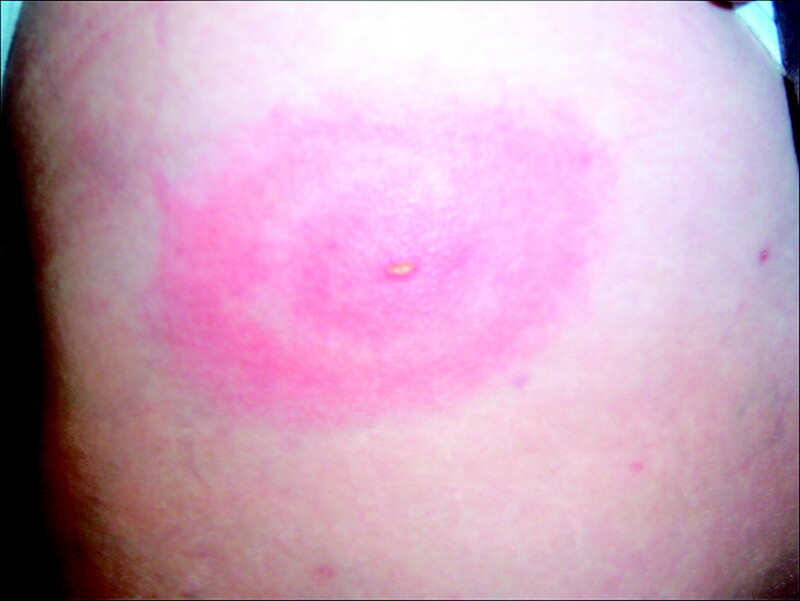 Because the spirochetes are transmitted to human beings only by the bite of infected ticks, individuals who do not frequent endemic areas or have not been in a situation predisposing to an infected tick bite cannot have LNB.8 The presentation of LNB can vary from weeks to months after exposure. Facial neuritis. A 48-year-old woman with headache and peripheral right facial palsy. Prominent enhancement of the fundal tuft and labyrinthine segment of the seventh cranial nerve on postinfusion axial T1 (A) and coronal spoiled gradient-recalled sequences (B). The patient had CSF pleocytosis, Lyme-positive EIA, and Western blot (IgM and IgG) in serum and CSF. Resolution occurred with intravenous ceftriaxone therapy. There are no neurologic or imaging findings specific for LNB. In the appropriate geographic and seasonal setting, facial diplegia is highly suggestive of LNB as is headache and facial palsy, especially when coupled with a history of erythema migrans. Because erythema migrans may be absent and is usually not present at time of the clinical presentation of neurologic symptoms, suspicion of LNB should be confirmed by serum or CSF antibodies for Borrelia species.8 Sarcoidosis may have a similar neurologic presentation and should be considered in the differential diagnosis. Evolving cranial neuritis. A 71-year-old woman with headache, malaise, fever, and diplopia. 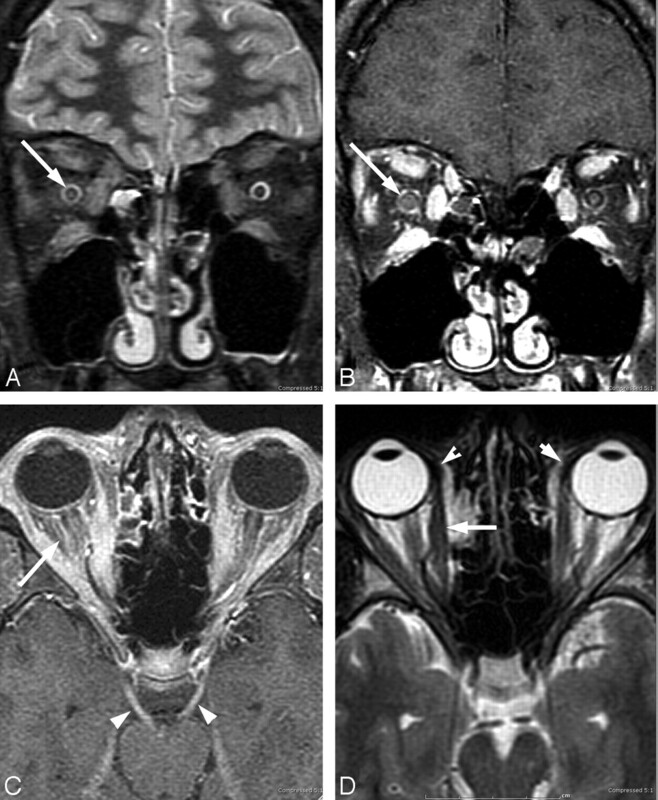 Initial coronal postcontrast T1 MR imaging (A and B) with enhancing bilateral third and fifth cranial nerves. C, Nine days later, she developed left facial palsy with enhancing fundal tuft and labyrinthine and tympanic segments of the seventh cranial nerve. The patient had CSF pleocytosis with positive Lyme-EIA and Western blot in both serum and CSF and CSF Lyme PCR-negative findings. Resolution occurred with intravenous ceftriaxone therapy. Direct CNS symptoms vary widely, ranging from a mild confusional state to severe encephalitis. Cranial neuropathies and motor or sensory radiculoneuritis have their highest incidence in children and adolescents.46 The intrathecal production of anti-B burgdorferi antibodies or a positive PCR are the most reliable indicators of CNS infection. The CSF typically demonstrates a lymphocytic meningitis, with increased protein and increased CSF-to-serum-antibody ratios. Encephalomyelitis is a very rare complication of borreliosis, with a few reports of progressive and severe courses of the disease.47–51 In most cases of encephalomyelitis, MR imaging is very helpful in assessing the presence of rare tumefactive white matter lesions that may mimic a neoplastic process.47,48,51 Tumefactive lesion biopsies are characterized by microgliosis and spirochetes morphologically compatible with B burgdorferi yet paradoxically without an inflammatory infiltrate.48,52–54 Very rarely, MR imaging has documented reversal of LNB encephalitis subsequent to antibiotic management.49,55 The imaging resolution, however, lagged years behind the rapid clinical response to intravenous antibiotics. A 50-year-old woman with a history of tick bite and erythema migrans rash treated with doxycycline, who had recurrent erythema migrans rash with headache, fever, nausea, and nuchal rigidity. The patient had CSF pleocytosis with positive Lyme serum EIA and IgM Western blot and negative Lyme antibodies in the CSF. Gradual symptomatic improvement occurred following intravenous ceftriaxone therapy. There has been stable MR imaging for 5 years. Sagittal (A and B) and axial (C) fluid-attenuated inversion recovery images show arcuate and confluent subcortical white matter involvement and callososeptal interface involvement remarkably similar to that in MS, but without involvement of the periventricular white matter. 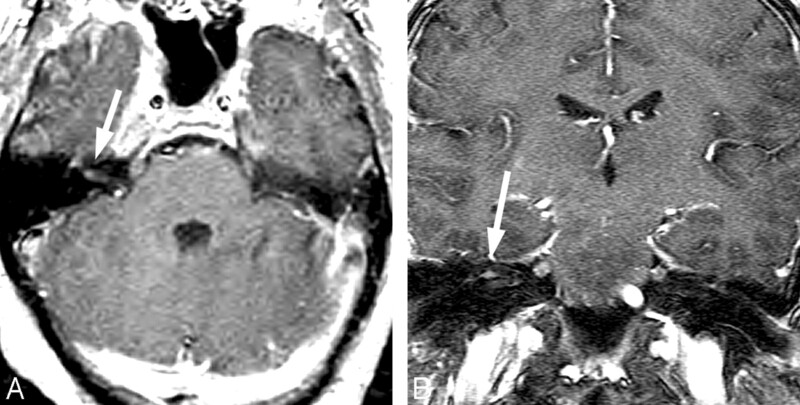 A 74-year-old man with 2-year cognitive decline and memory loss. The patient had Lyme-positive serum EIA and Western blot (IgG and IgM) and CSF pleocytosis with CSF positive Lyme IgM and IgG antibodies. The patient improved with intravenous ceftriaxone therapy. The “dot-dash” callososeptal interface (A) and periventricular distribution of involvement (B) would be routinely ascribed to a demyelinating process. A 56-year-old woman with neck, bilateral shoulder, and bilateral arm pain. In 2 weeks, she subsequently developed left facial palsy and positive serum EIA and Western blot (IgM and IgG) and CSF Lyme IgG and IgM antibodies. Complete resolution of symptoms occurred with oral doxycycline. 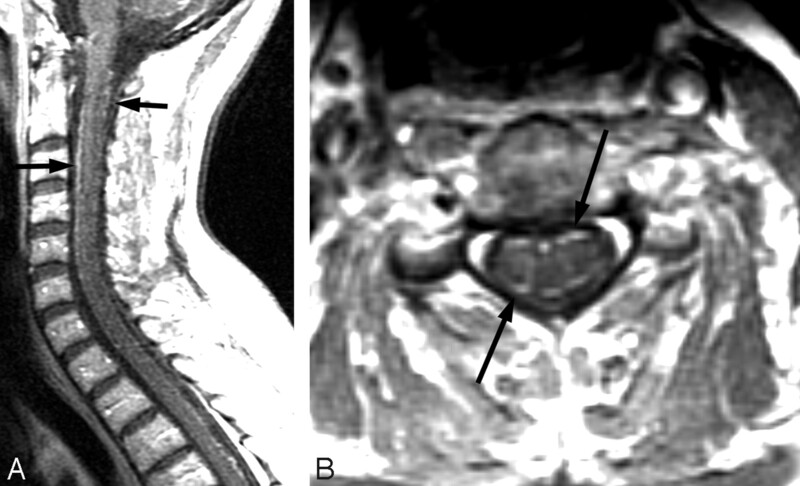 Postcontrast sagittal and axial T1-weighted MR images show diffuse thin uniform cervical spinal cord leptomeningeal enhancement without apparent root or ganglion enhancement. Rare ocular LNB may occur at all 3 stages of the disease. Uveitis and optic neuritis are the most common ocular complications.78 Conjunctivitis and episcleritis are the most frequent manifestations of the early stage. Neuro-ophthalmic disorders and uveitis occur in the second stage, whereas keratitis, chronic intraocular inflammation, and orbital myositis are seen in the third stage of Lyme disease.79 A nonspecific follicular conjunctivitis occurs in approximately 10% of patients with Lyme disease.39 Direct ocular infection and a delayed hypersensitivity mechanism may be involved at different disease stages. A 17-year-old boy with right papilledema and orbital pain and rule out pseudotumor. The patient had positive serum EIA and Western blot (IgM and IgG) and CSF Lyme IgM and IgG antibodies. Lyme PCR in the CSF was negative. Complete resolution of symptoms occurred after intravenous ceftriaxone therapy. Right optic nerve edema on fat-saturated T2-weighted fast spin-echo images (A) and right-greater-than-left optic nerve enhancement on coronal fat-saturated contrast-enhanced T1-weighted images (B). C, Bilateral third cranial nerve enhancement (arrowheads) and bilateral retrobulbar compartment congestion (arrow). Note the generalized extraocular muscle enlargement and enhancement, including the insertions. Additional imaging findings included enhancement of right fifth cranial nerve, optic chiasm, and intracanalicular right seventh nerve, all of which were occult to neurologic examination. Thirty percent of Lyme disease cases occur in children.3 The presence of erythema migrans in 89% of children significantly aids the clinical diagnosis.81 It is speculated that the CNS lesions in children represent a spirochete-triggered autoimmune process.82 Headache is the most frequent neurologic symptom; the most common neurologic signs of pediatric LNB include facial nerve palsy (3%–5%) and meningitis (1%). Less common manifestations are sleep disturbance and papilledema associated with increased intracranial pressure.83,84 Ataxia, chorea, myelitis, pseudotumor cerebri, meningitis, and encephalopathy are very uncommon.84–90 Peripheral neuropathies, radiculopathies, and Bannwarth syndrome are other rare pediatric LNB manifestations. Despite having a greater incidence of LNB, the clinical course in most children is milder and shorter than that reported for adults.89 Facial nerve palsy resolves in 95% of pediatric patients irrespective of treatment.90 The use of doxycycline for the primary therapy of Lyme disease is restricted due to side effects in this population of patients. LNB is an insidious infectious neurologic disease caused by the spirochete B burgdorferi. The mechanism of neurologic injury probably includes vasculitis, cytotoxicity, neurotoxic mediators, or autoimmune reaction via molecular mimicry. Although there are no neurologic or imaging findings specific for the diagnosis of LNB, an enhanced level of surveillance is required as a function of geography, recreational/travel history of the patient, and season of the year. In the at-risk patient population, LNB should be included in the imaging differential diagnosis of facial neuritis, multiple enhancing cranial nerves, enhancing noncompressive radiculitis, pediatric leptomeningitis with white matter hyperintensities, and symmetric orbital myositis with cranial neuritis. There is an overlap in the CNS MR imaging appearance of LNB and MS; however, unlike MS, cervical cord pathology and occult brain involvement in normal-appearing white matter are infrequent findings in patients with LNB. Further refinements and ongoing research in serum and CSF serologic tests will be required for better detection of active acute and chronic manifestations of Lyme disease.